First a note of caution. This piece was published in November 2018, and it’s entirely possible – indeed probable – that things will have changed if you’re reading this at any point after that date. It’s also worth noting that I’m in the UK, and these solutions may not work in your region. Also, I’m doing this with the Android Apps for Google Assistant and Amazon Alexa. iOS apps may vary – but hopefully not very much. It’s not entirely clear when the first radio alarm clock was created, but the Bulova M-781 from 1932 seems the most likely. It was a grandfather clock with a radio built in that did indeed switch on according to a timer. What is more certain is that over time, the radio alarm clock became a significant category in the radio world. Most manufacturers of radios built at least one, and probably more, radio models. Most still do. 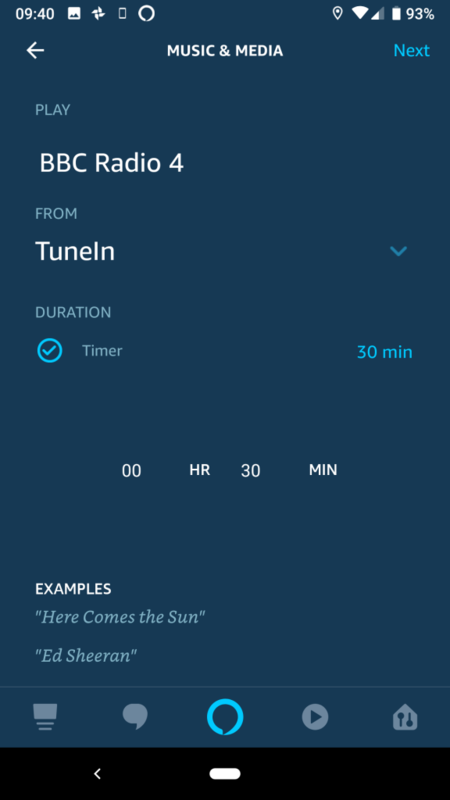 Having a radio turn on and wake you up in the morning is a basic use case for radio. Recall that the biggest radio audiences are to be found in the morning. 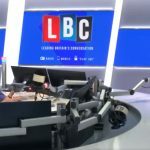 Fast forward to 2018 and what do you do to wake up to the radio in the morning? Well, you could still go out and buy a radio alarm clock. While there are still a disappointingly large number of basic FM models that don’t look like they’ve had a refresh in thirty years, you can at least buy DAB models on most of Europe. Many people use their mobile phones. But you’ve been busy buying smart speakers to kit out your home. Can you use these to wake up to the radio? In general, they sound better than your mobile’s speaker. Well, yes you can. But it certainly isn’t easy. Indeed, when I asked a few owners smart speakers if they did it, I was usually informed that it wasn’t possible. Before I started, I did a fair bit of Googling to see how easy it was. The methods I describe below have only become available relatively recently. So prior to that, the preferred solution was an hilarious hack. It involved recording yourself on your mobile phone saying something like “Alexa, Play Radio 1.” Then use this recording as an alarm sound on your phone. 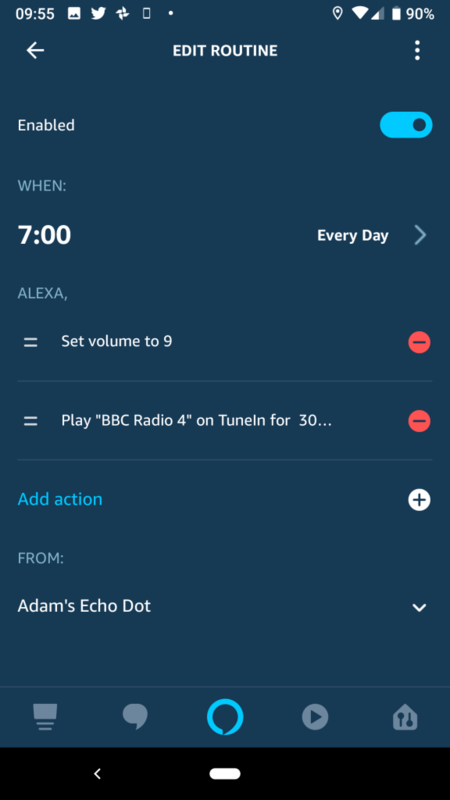 So at 7am or whenever, your phone pipes up: “Alexa, Play Radio 1” and then the nearby Alexa in your bedroom starts blasting you with Greg James. Of course if you happen to charge your phone away from your bedroom Alexa, then you could be in trouble. And let’s hope that you didn’t leave your phone in a jacket pocket or a bag the night before, or you forgot to put it on charge so that it went flat and as a result your alarm failed to go off. We’ll assume that your use case is that you’d like the radio to switch on perhaps 5, 6 or 7 days a week, with the station of your choice, at the volume of your choice. And perhaps you’d like to have different alarms set for the weekend. I don’t think that’s anything too complex. Before we continue, I should note that all the major radio apps have this basic functionality built in by default. 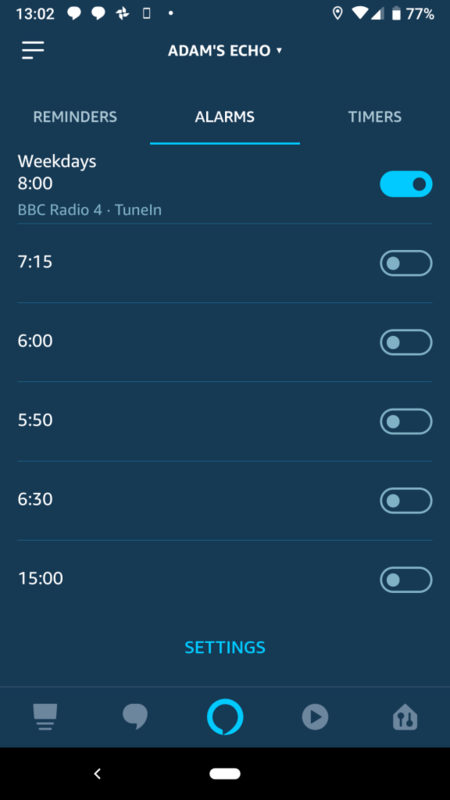 BBC iPlayer Radio, Radioplayer and Tune-In all have this functionality – they all also have sleep timers too (BBC Sounds, for some reason, has not yet added this functionality). But you want to do this by voice. Let’s see how easy it is with the Google Assistant or Amazon Alexa. Note that I’m using Android apps throughout. To make this work, you need to use Routines from within the Google Home app. It might be possible to set this up purely by voice (as you can with Amazon Alexa), but if it is, I’ve not worked out how to do it. I’ve got to be honest: while it has improved in recent iterations, I find the Google Home app particularly messy. I think it needs a top to bottom redesign since too many important things are buried away in sub-menus. I suspect that most users don’t use the app all that regularly, mostly using it when they set up new devices on their home network. So even if you work out how to do something, when you use the app again some weeks or months later, you won’t remember exactly how to repeat processes you previously worked out. To set a routine, you should be on the same WiFi network as your Google devices. In other words, you’ll need to be at home to do this. Within the App you go to your Account, and then Settings. 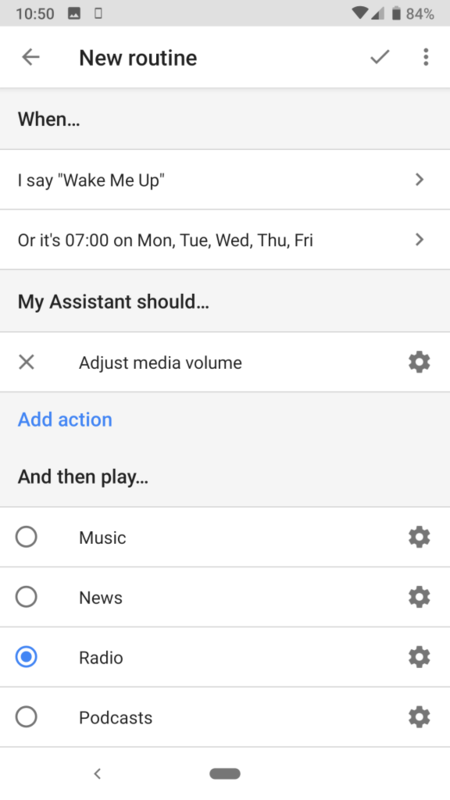 From here you choose Assistant, and then scroll down to Routines. 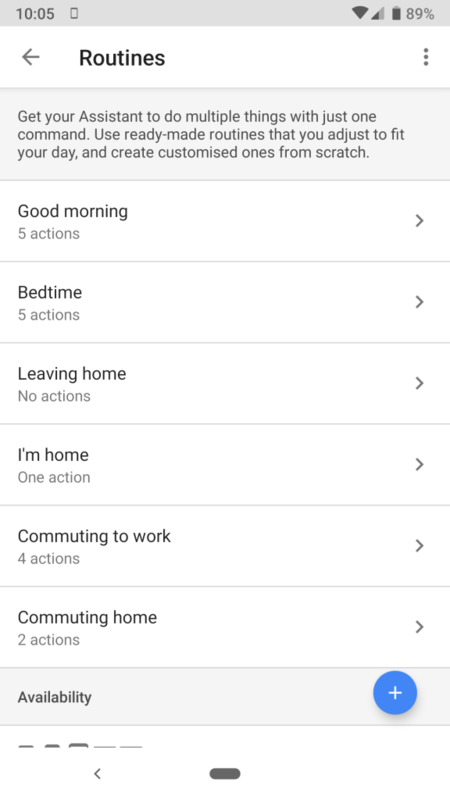 By default, Google has set up a number of example routines – Good Morning, Bedtime, Leaving Home, I’m Home etc. But all of these are voice activated. In other words, it would rely on you saying “Hey Google, Good Morning” to activate the Good Morning routine. You need to create a Custom Routine – and it’s entirely possible that in some regions, this isn’t yet possible. 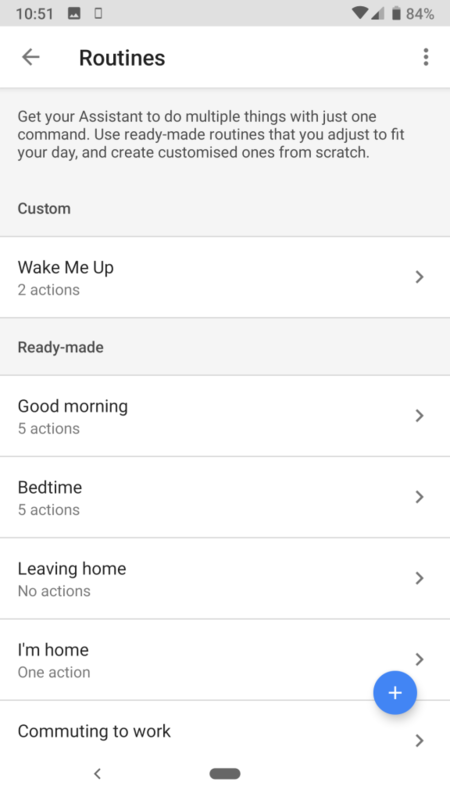 Google’s own help page claims that Custom Routines are US only at the moment – but it worked for me in the UK. Click the + in the bottom right corner to set up a New Routine. This is the key screen for setting up your routine, and the first box is perhaps the most confusing. Google wants you to have a spoken command for your routine – and that’s not optional. Now obviously, if you’re using this routine to wake-up, you’re unlikely to be in a position to say anything to kick-start the whole thing. The good news is that although you have to provide some words, they’re not the only way to fire off the alarm. So click on Add commands and fill in the box with some text which you’re unlikely ever to need to say. Press the left arrow to go back and next go into Set a time and day. This is pretty easy to complete, choosing a time and then selecting which days you want it to apply. You also need to select a speaker. And if you’ve grouped several speakers together into a Group you can start this routine on multiple speakers. 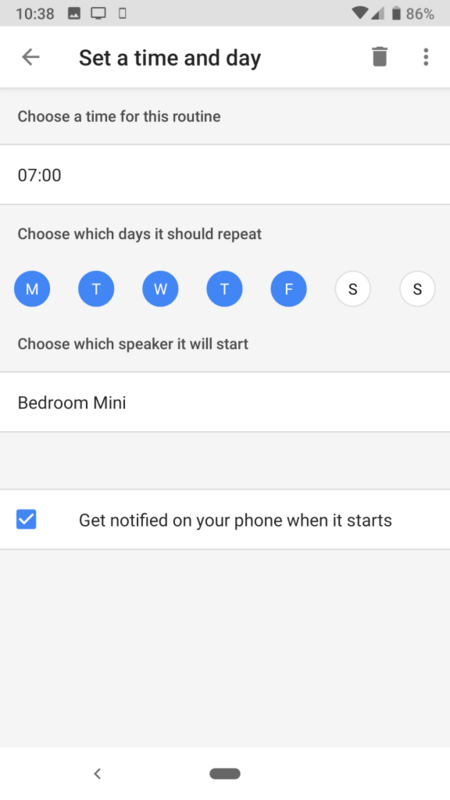 In the example below, I’m using the speaker I’ve named Bedroom Mini. You can choose whether or not you want your phone to be notified as well. Use the left arrow again to get back to main screen and you’ll have something like this. 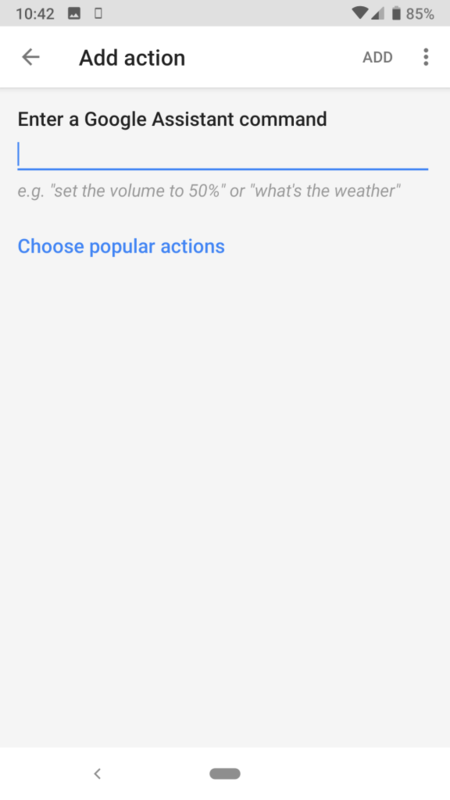 Here you’re presented with a text box and a couple of suggestions from Google about setting a volume or giving you the weather. Again, you’ll be able to add multiple actions, so if you do want the weather before the radio kicks in, then here’s the place to do it. Rather than use written words to set the volume, we’re going to go into Choose Popular Actions. 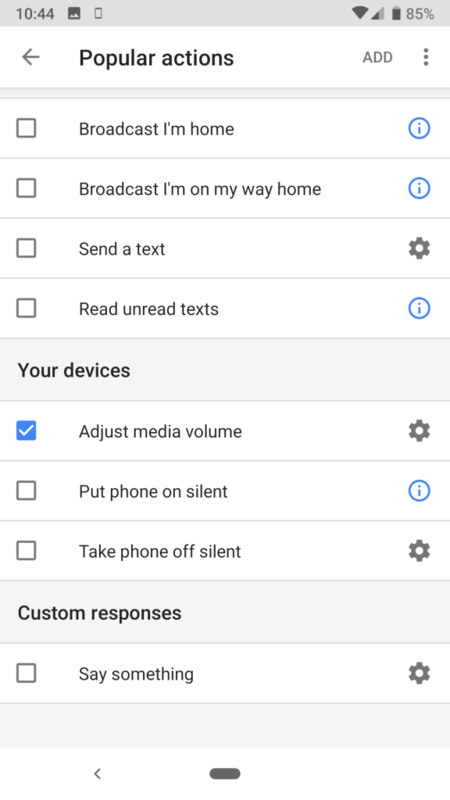 Scroll down to the Your Devices section and select Adjust media volume. Then press the cogwheel to set a volume level. Use the top left arrow to navigate out of that menu back to the main screen, being sure not to press it again. That’s because you need to press ADD in the top right hand corner. 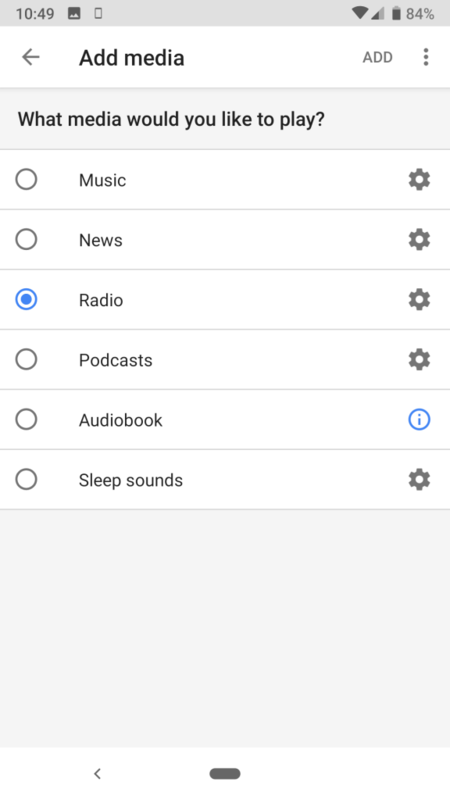 Go to Add media and select Radio in the options. Click on the cogwheel and you again get a blank box asking you type a radio station. 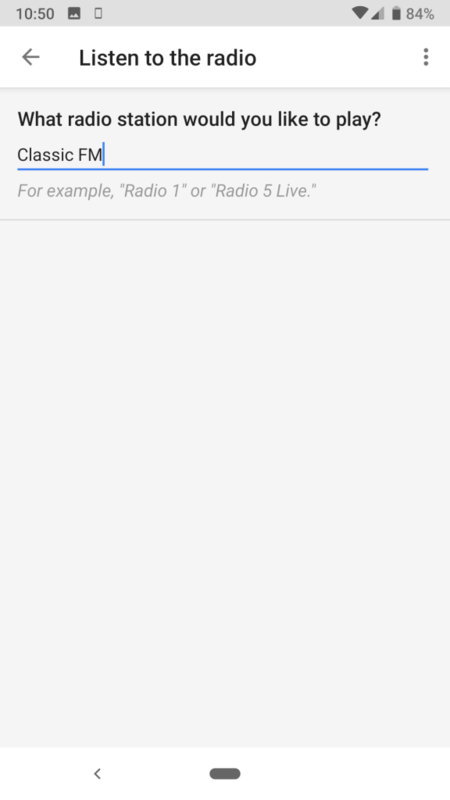 Google gives you two BBC examples, but we’ll choose another station. Again, if you’re uncertain what to type, try a voice command with your Google device first to ensure that you get the right station, and the right version of the right playing. You’ll want to make sure you get the right Capital or Heart! Use the left arrow to get back to the main routine screen. At this point you could add additional actions like switching on light bulbs or other smart home connected devices. We won’t bother here. Then be sure to press the tick-mark and not the left arrow again to save your changes. Your routines screen should now look like this. And that should be it. Your radio alarm should be set. However, there is a lot I’d like to see improved in the Google Home app to make this easier. Not least the completely non-intuitive way to navigate it. Starting with my profile, then settings and then another sub-menu to even find routines is madness. My biggest issue, remarkably, is timing! In my tests, the radio didn’t quite come on when I expected it to do. It would be perhaps one to two minutes late. This seems quite extraordinary, and I’ve no idea why, unless there’s some processing time on a Google server somewhere between me updating my routine and Google being in a position to serve it on my Google device. As a result of this, I would suggest setting your timer early particularly if you value every minute of sleep you get. I would also note that in at least one instance, my device failed to play the radio at all. An initial beep sounded indicating that the routine was starting, but then nothing happened. Then there is an issue of zombie routines. In my tests, I twice created a test routine, then having finished with it, I deleted it. But later it returned unwanted and I had to delete it a second time – this time seemingly permanently. The next issue is the confusion about requiring some command words for a timer. It’s fine to have the option to use these, but for some routines, you just want them to work at the times of your choosing regardless. 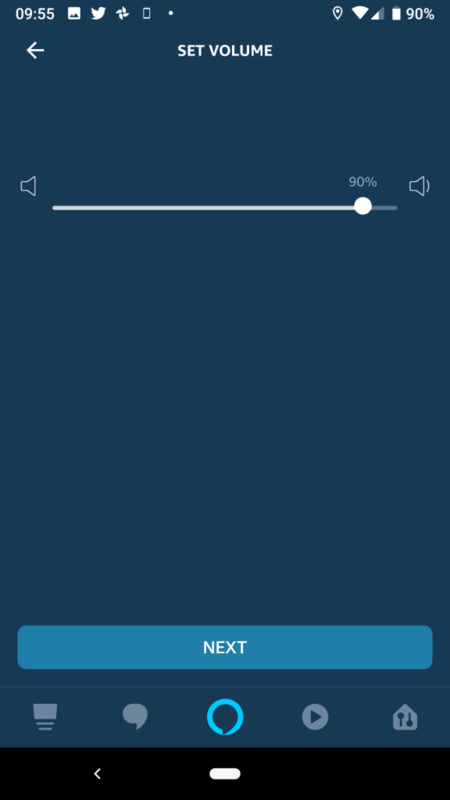 Another key issue is that I can find no way to set the duration of the radio once it has turned on. Many radio alarm clocks will time out after a period of time, and as we’ll see, Amazon lets you do this. 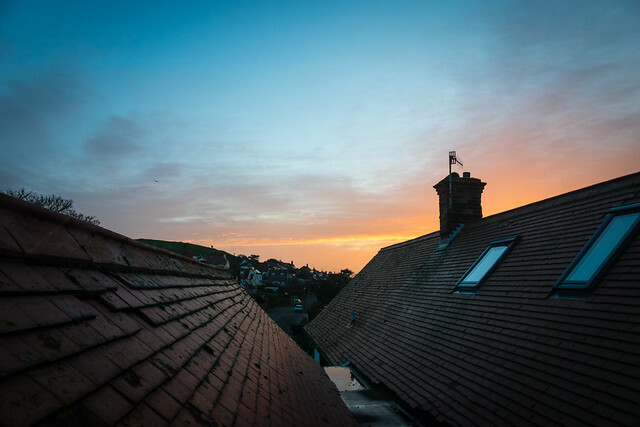 It could be particularly annoying if you fail to turn off an alarm when you go away for a few days. Finally, there’s no volume fading – the radio just starts instantly at your set volume. Google is not alone with this, but it would be nice to fade in the audio gradually. Overall, it’s not a great experience using the alarm, with them not starting on time and even failures to start at all. I’d be nervous using it alone. Furthermore, the app is not intuitive, and even finding the right place to set them up is not simple. 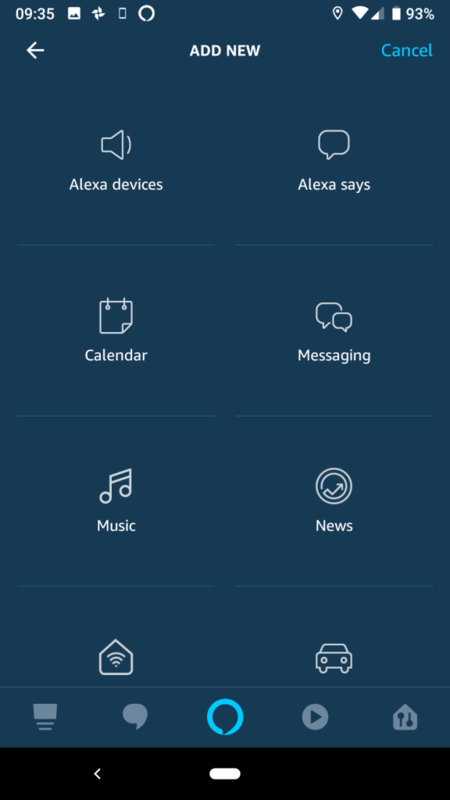 In general terms, I think the Alexa app is somewhat ahead of Google’s right now. It’s slightly more intuitive. and overall I had less difficulty setting it up. Again, this is probably easier to do when you’re on the same WiFi network as your Amazon devices. You can actually set an alarm by voice with Amazon Alexa! Thanks to Daniel for pointing that out. You won’t have quite the control that going through the app gives you, but this is by far the easiest way to do it. If you say something like: “Alexa, wake me up every weekday at 8.00am with Radio 4” it should confirm the time and indeed set an alarm. 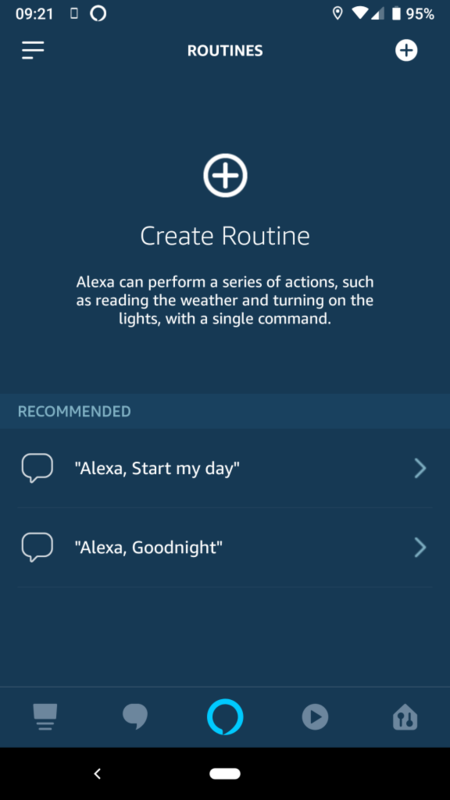 You can confirm this by going into the Alexa app and looking in the Reminders & Alarms section and selecting ALARMS. You can go into the alarm and make adjustments to days of the week or the time. 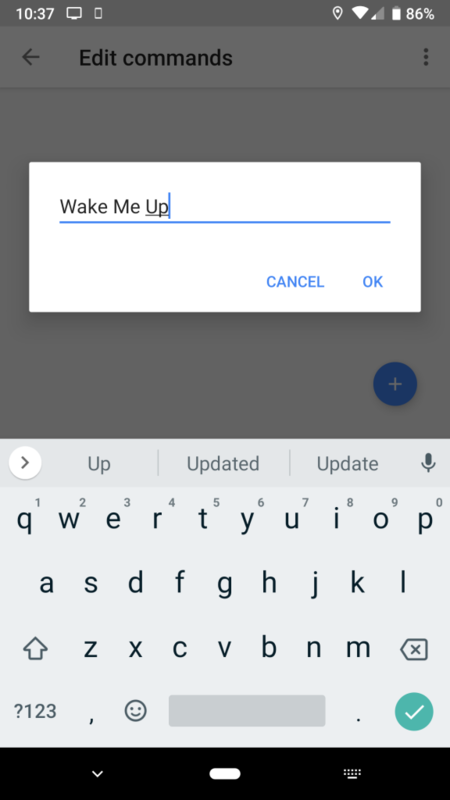 Note that you can’t set up an alarm on the app this way if you want to listen to the radio! You have to first set it up via voice. Also note that you have no control over the volume, which will be the previous volume set, or add in additional functions like switching on lights or reading the weather to you. Finally, the alarm will come through the device you set it on. If you want more granularity, then you need to go into a different part of the app. You want to ignore Reminders & Alarms. Instead we now want Routines. Hit the + icon to create a new routine. Select Schedule from the list of options. And on the Set Time page choose Select next to At Time. 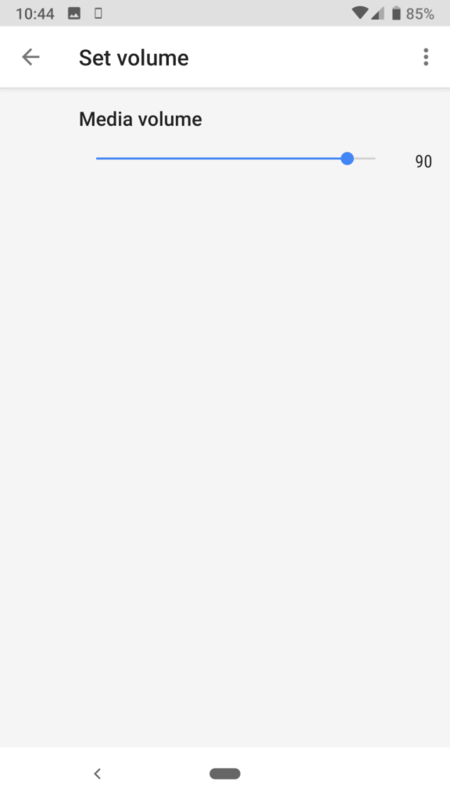 That opens a screen that is mostly blank with a tiny time in the middle of it, defaulting to the current time. 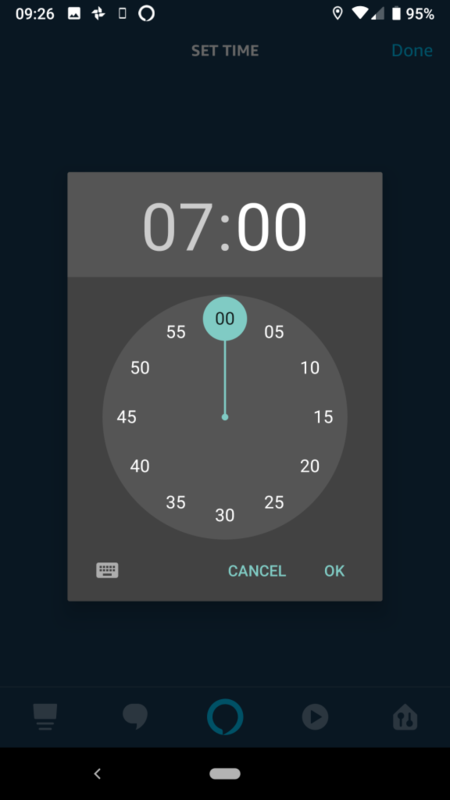 Press it and (in the Android app) you get the familiar Android clock allowing you to set the time e.g. 07:00. Click Done in the top right hand corner of the screen when you’re happy and then choose Select next to Repeat. 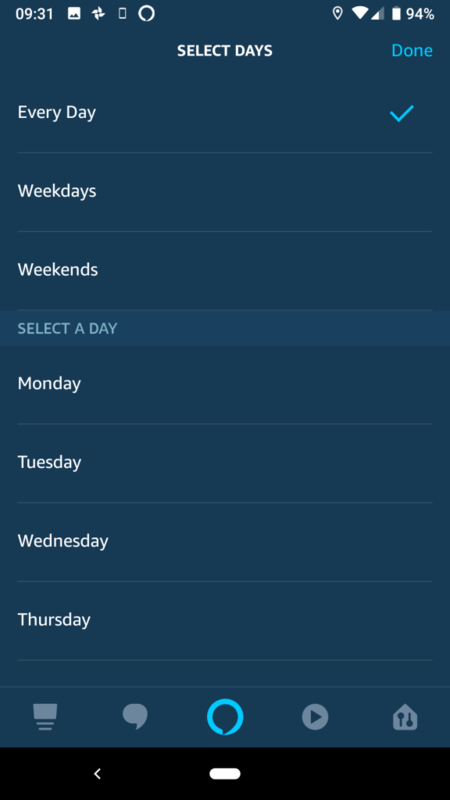 The default is Every Day but you can change it to specific days, weekdays or weekends. 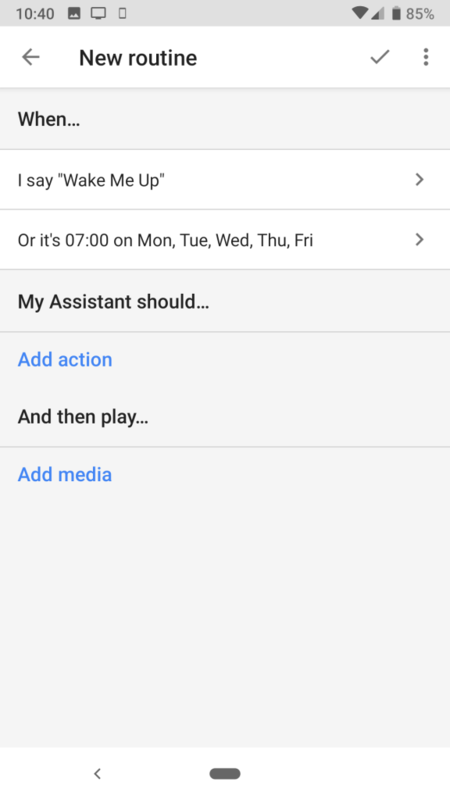 Of course you can set multiple routines for weekdays and weekends. We’ll stick with the default for now. Select Done and you should have a screen that looks a little like this. Now you need to Add Action. Press the + next to it. And you get a choice of things you can do. It’s worth noting at this point that you could add multiple actions here. Alexa could say, “Good morning!”, then play you your news via whatever choices you have set in your Flash Briefing. But in this case we’ll just turn on the radio. So you need to choose Music. Yes, even if you want to listen to Radio 4 when you wake up. In Song, Artist or Playlist you need to spell out your preferred radio station. And an important note here is that it needs to be available on TuneIn. If it’s not, then this won’t work. If you’re not sure, try using your Alexa to see if it selects the right station. 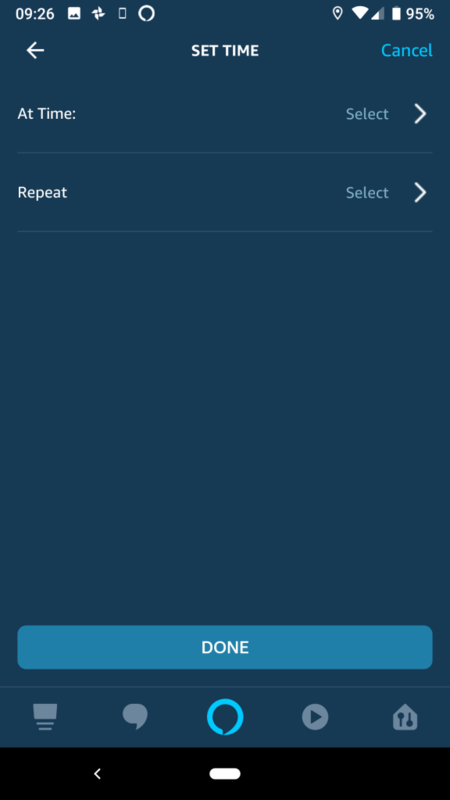 Then in the Provider section under the word From, choose TuneIn. Finally, you can set the duration of the timer. The default is 30 minutes. Press Set Time and choose a duration. Click Next and you now have the opportunity to add further actions. The one other thing we’re going to do is set the volume of our Alexa. 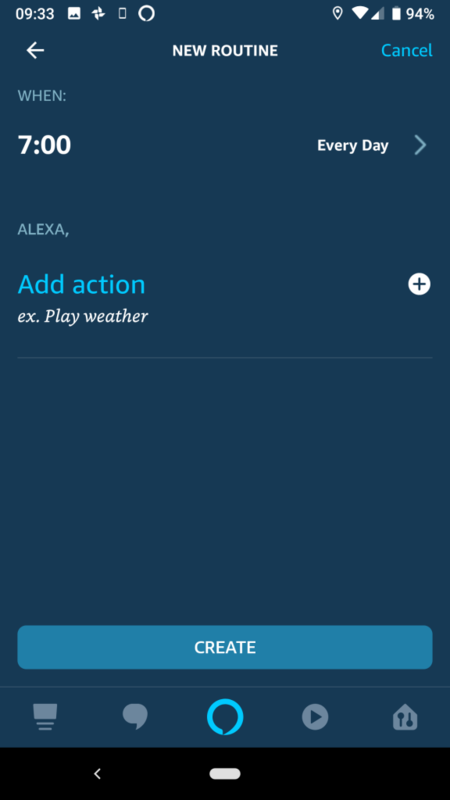 Click the + next to Add Action and select Alexa Devices. Select Volume and you get a slider to choose your volume. Choose a number you’re happy with, then click Next and Add. You’ll notice that the volume is set ahead of playing the radio. If not then you can move them around using the = buttons. Finally you need to choose the Echo device that the radio comes from. 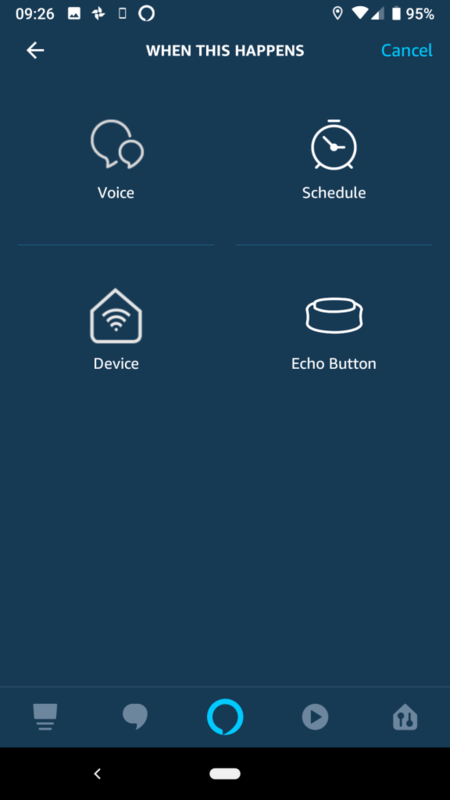 If you have multiple Echo devices, choose one in the From list. I don’t believe it’s possible to have routines play on multiple devices at time of writing. Press Create and you should be done. A message will say that your routine has been saved and it will appear as an Enabled routine. If you need to delete or disable a routine, select it and then use either the disable button to turn it off, or the menu dots in the top right to delete it altogether. Note that you can also test the routine by going into the routine, pressing the menu button and choosing Play Routine. 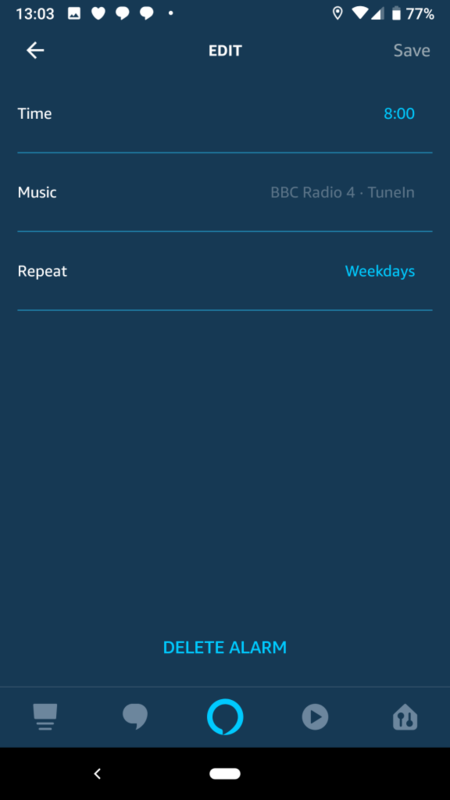 That should ensure that that TuneIn really does manage to pick the right station for you. This will also let you fine tune your preferred alarm volume. In general terms, this solution works well, but I don’t think it’s completely intuitive. 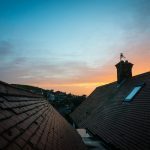 You might have worked out that you can wake up to a track, or a Spotify playlist (although for me that makes me think of Groundhog Day) but not realised that you could choose a radio station. The only key thing I’d like to be able to do is fade up the volume. It starts quite abruptly and a little bit of a fade might be better – although few radio alarm clocks do that. If you have other smart home devices, such as light bulbs, you could switch those on too by adding a further action to your wake-up routine and choosing Smart Home. Again, it’s not perfect though. I have some Hue bulbs and the Hue app lets me brighten them slowly over time. 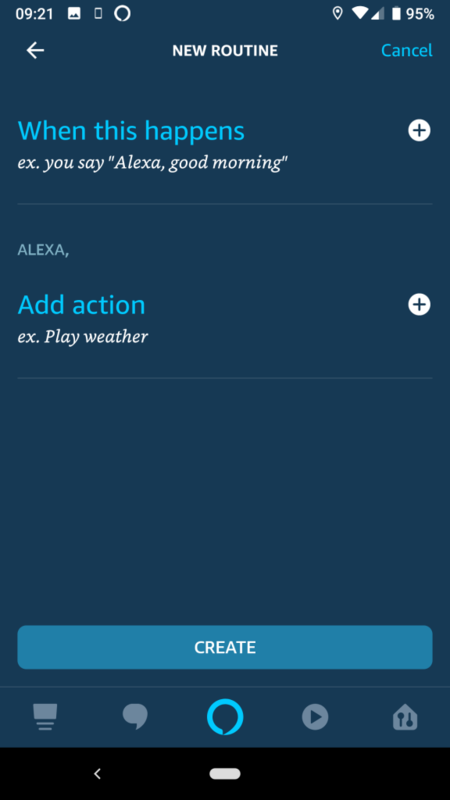 The Alexa app just allows me to turn them on – albeit I can choose the brightness. A gradual increase in brightening might be nice. The Google Assistant is similarly limited in this regard. The other thing you could try is IFTTT – the service that allows you to connect devices and apps together using the various APIs the companies make available. The only trouble with this is that it can be non-trivial to build these connections, and in any case, I’ve not found a way to do it. I’m really not sure why such a simple use case is so hard to achieve. I really shouldn’t have had to write a tutorial to explain how to do it. When smart speakers first emerged, they quickly became the best internet radios you could buy – assuming your voice was understandable by the devices, and your choice of radio station was available to stream. Adding alarm functionality to these radios should be trivial. As I note at the top, all of the above is true at time or writing in November 2018. Undoubtedly both Google and Amazon’s apps and devices will improve over time, and I trust that it will become easier to set a task like this.